Headquartered in Clearfield, Utah, Lifetime Products, Inc. is the world's leading manufacturer of residential basketball hoops and folding tables and chairs. With manufacturing facilities in Utah, USA and Xiamen, China, Lifetime has applied innovation and cutting-edge technology in plastics and metals to develop innovative products with superior strength and durability. New offerings including outdoor sheds, kayaks and tent trailers are just a few of the ways that Lifetime continues to simplify your everyday life and enables you to get the most out of your free time. Since 1986, Lifetime has transformed basketball by bringing the game home. 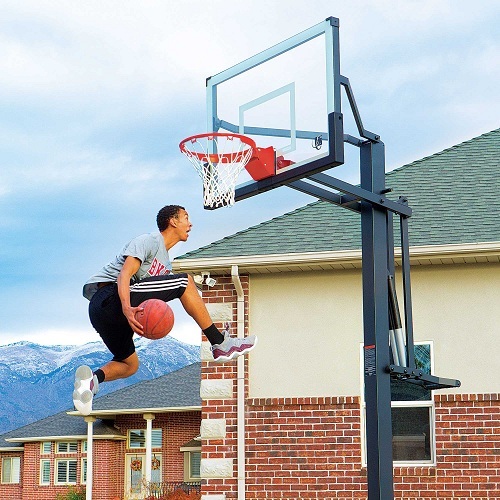 With a large assortment of portable basketball systems, in-ground goals, wall/roof mounts, and heavy-duty high-end systems, Lifetime is the world's leading manufacturer of residential basketball equipment. Lifetime now offers soccer goals, tetherball equipment, kayaks and more. We continue to grow in the sporting goods industry, making products that transform the way you play. Lifetime will produce high quality, innovative products while growing profitably and providing opportunities for our people. Through synergistic diversification, we will enter new product categories in a timely manner. We will expand our market share while continuing to identify additional distribution channels. We will find ways to flow value to our customers at a higher rate of speed while lowering costs. We will become a company worthy of the Shingo prize. We provide a SAFE work environment. Our brand is world class and of great value to our customers. Our products reflect our dedication to QUALITY and INNOVATION. We always treat our employees, customers and suppliers with RESPECT, HONESTY and INTEGRITY. We look to promote from within the Lifetime family whenever possible, giving our employees opportunities. We understand the importance and power that is found in unified TEAMWORK, and we work to succeed as a team, not as individuals. We are conservative in our spending, and we maintain a LOW DEBT structure to ensure a recession-proof financial position. We respect the environment in which we live, and we continually look for ENVIRONMENTALLY FRIENDLY solutions to decrease our waste. Lifetime is committed to providing high quality products, delivered on time, that meet customer requirements, while maintaining a fair profit margin and increasing sales. We accomplish this through product and process innovation, cost reduction activities, compliance with ISO 9001 requirements and the continual improvement of our Quality Management System. 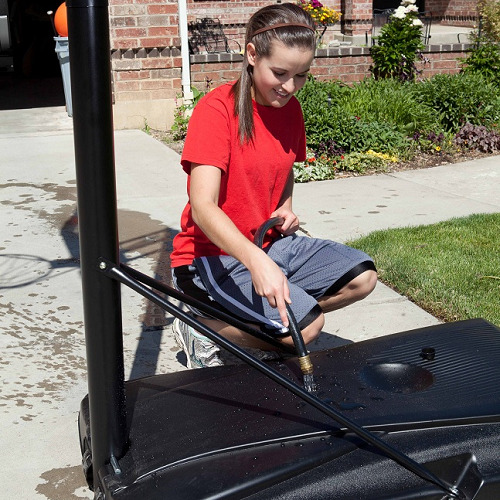 In 2008, Lifetime created an ingenious line of yard carts and wheel barrows made from post consumer recycled materials. In 2009, Lifetime introduced the Jumping Jack Trailer, an outdoor camping trailer that converts from a heavy-duty hauling trailer to a full-sized tent in less than two minutes. In 2009, Lifetime created the Compost Tumbler, an innovative composter made of 100% recycled materials that virtually eliminates the mess and odor of composting. In 2010, Lifetime acquired Dragonfly Innovations, expanding its sporting goods line to include Dragonfly kayaks designed for beginners in water sports. Lifetime basketball systems are built to withstand all types of weather. All of our parts are designed to handle both cold and hot temperatures, so there really isn’t much maintenance needed. But, by taking a few extra minutes to follow this quick maintenance checklist, you can keep your system looking new year after year. 2. Check and replace the nylon net if worn or damaged. If you know you will not be using the system for a long period of time (during the winter etc. ), it is usually a good idea to take down the nylon net so it does not deteriorate over time. 3. Check all nuts and bolts. If any are loose, tighten them. 4. Check all parts for excessive wear and tear. If necessary, replace any parts that have been worn or damaged through usage. 5. Check the Pole Cap for cracks or tears that could let water in the Pole. Contact Customer Care for replacement parts if needed. 6. Check all pole sections for visible rust or chipped or cracked paint. If either are present, use an emery cloth to completely remove any rust or chipped paint. Clean the area with a damp cloth and allow it to dry. Apply two coats of a rust preventative, high gloss enamel paint to the area. Allow the paint to dry between coats. If rust has penetrated through the pole anywhere, replace it immediately! 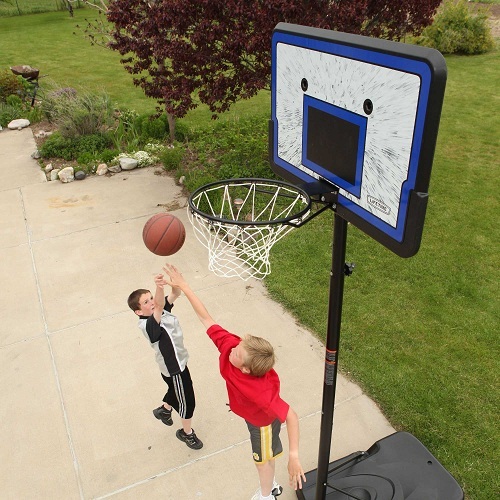 We know you're excited to start playing on your new Lifetime Basketball Hoop. But before you start shooting like an all-star, make sure you fill your portable base to ensure it is safe so your system will not tip over and get damaged, or possibly cause injuries. These quick tips will help you fill your base properly so your hoop will be ready for you to unleash your Michael Jordan skills. Lifetime portable basketball bases are designed to be filled with either sand or water, and each one has pros and cons. • Sand is about 45% denser than water, which increases the system's stability making it more difficult to tip the system. • Sand makes it more difficult to move the system on a regular basis if needed. • Sand is more expensive and more difficult to put in the base, but it will not evaporate like water. • Water is significantly easier and cheaper than filling with sand. • Water can evaporate over time so you'll need to check the water level frequently to keep it full and to ensure there are no leaks. 1. (Read your specific model Owner's Manual to learn how much to use of either filler option. 2. Lay the basketball system on the ground so it balances on the rim and the base plug is facing upwards. 3. Have an adult hold the pole down so the system does not tip up during filling. 4. Unscrew the base cap. 5. Place a funnel in the base hole and fill pour in sand. 6. Screw the base cap onto the fill hole. 7. Using two adults, slowly stand the system up on a flat surface. 5. Use a garden hose to fill the base with water, leaving two inches at the top for expansion. 7. Screw the base cap onto the fill hole. 8. Using two adults, slowly stand the system up on a flat surface. Choose whichever option is best for you. Just remember, if you ever have a cracked or leaking base, do NOT play on the system. Instead, lay the system on the ground and contact Lifetime Customer Care for assistance. All basketball hoops are not the same. Lifetime makes over 125 different models of basketball systems - each one with a different combination of features. We know the choices can seem overwhelming at first. So, we've put together this list to help you understand the different types of features that are available for beginner, intermediate, and competitive players. Before you purchase a basketball system, first decide where you are going to place it to determine which style of system to buy. By far, the most popular place for a basketball system is a driveway, and a portable system is ideal for this location. Portable systems have a base that rolls on wheels and is filled with sand or water for stability. Simple assemble, fill the base, and play today. For larger driveway or designated courts, in-ground systems are a better option. Since the pole is installed in cement, they take up less space and are more stable than portable systems. If purchasing an in-ground basketball system, make sure there is enough room around the system. And, remember, you will need to allocate 72 hours for cement the to cure. The performance of a backboard is tied directly to the material it is made of. All Lifetime backboards feature screen-printed graphics with UV-protected inks for superior color and protection against the elements. Molded of high-density polyethylene. Great for beginners or youth and the most affordable option. These boards integrate a clear acrylic playing surface with an unbreakable polyethylene frame for a pro-glass look. Ideal for intermediate players. An acrylic playing surface gives you the look and play of pro-style glass. The steel-framed provides added rigidity improving rebound. Acrylic backboards feature professional styling. While not as durable as polycarbonate, they do provide a better rebound and are available in beginner, intermediate and competitive sizes. Made with a Makrolon® polycarbonate playing surface and a high-impact polyethylene frame, these boards are virtually unbreakable and many times stronger than acrylic. The superior impact strength of Makrolon® polycarbonate provides enough protection to withstand the toughest abuse. A steel-framed tempered glass backboard is the ultimate in arena styling and professional play. The sturdy steel Y-extension arms provide superior rebound and play, and the heavy-duty steel frame gives added rigidity. Tempered glass is the premium playing surface and gives you the look and play of the professional game. It is what is used in all collegiate and professional games. Rims are an important part of performance. All Lifetime rims are made with a 5/8-inch ring of solid steel and welded-steel net hooks which do not require replacement and help avoid the annoyance and danger of dangling net loops common in cheaper rims. The basic model rim bolted directly to the backboard and ound on beginner systems. A heavy-duty classically-styled rim built to take a slam with double-compression springs providing spring-back action. Built for aggressive play with an arena-style wraparound brace and double-compression springs that let you slam it like a pro. Lifetime invented the first adjustable height basketball hoop. The ability to raise or lower the backboard from 7.5 or 8 to 10 feet with no tools required allows players of all ages, heights, and skill levels to easily play on the same system. Adjust by tilting the system to the side, removing knob or bolt, and telescoping the system up or down in 6" increments from 7.5 to 10 feet. This is the original height adjust mechanism that Lifetime invented over 25 years ago. Put the end of a broomstick handle under the rim and adjust the system up every 6". To lower, simply place broom handle in release latch located behind the rim and lower system . Typically adjusts systems between 7.5 or 8 to10 feet in 4 or 6" increments. A simple, two-hand adjustment that allows you to raise or lower the rim height from 8 to 10 feet using a locking steel bar. Adjusts with just one hand from 8 to 10 feet. The counter-balance springs do most of the work for you! Easily adjusts with just one hand from 7.5 to 10 feet. The counter-balance springs do most of the work for you! A convenient, two-hand adjustment at the front of the pole instead of behind it. Adjusts height from7.5 to 10 feet. Infinite increment adjustment from 7.5 to 10 feet. The pneumatic mechanism allows instant and effortless height adjustment with just one hand. A trigger-less adjustment mechanism that allows one-handed infinite increment height adjustment from 7.5 to 10 feet.